Facial Oils after cleansers are my greatest obsession and have been for over 25 years, around the time cleansing balms were part of my routine, I found the glorious Lotus Oil from Clarins, and I still buy it, oils have always worked well for my skin and I would choose them over moisturiser any day. So, what do oils do for my skin, that's the question really, aside from pretty packaging and nice smells, what does the product actually do. I choose oils mainly to keep my skin hydrated, and dewy, I love dewy, I like residue on my skin, anything absorbed super quickly leaves me in a state of flux. For this article I haven't included the retinoid oils, they will get their own heading, this is about the oils I have loved for their skin dewy, glowy prowess and keeping my skin in lovely smooth condition. Clarins - their facial oils just work, it's as simple as that, my skin looks better for using them, I currently only have the Blue Orchid oil for dehydrated skin which works to prevent moisture loss, tone, revitalize and give radiance to the skin. This works a treat either used topically or over the whole face. An all year round oil, rich, leaves a glow to the skin and like all my favourite oils, I see life on my skin, it looks healthier, cleaner and brighter. Kiehl's, the only oil I have used from the brand and it transforms my skin, there is a glow, a subtle change to the skin, brighter, lighter, softer and dewy. When the clock strikes midnight, well, Midnight Recovery Concentrate can't turn a pumpkin into a carriage but, using distilled botanicals, squalane, lavender and primrose oil, this gives you fresher skin by morning. Emma Hardie, well, you know the drill, it's all about the cleanser and has been, for me, for many a year. But, the skincare range has rather a lot to offer and this Brilliance Facial Oil is just that, rather brilliant. I started with a sample of this essential, plant and Omega 3, oil, used beneath moisturiser as part of my morning routine it gave my skin a silky, healthy and protected finish, it contains camelina oil, which has powerful anti-oxidant properties. My makeup worked better onto my face and the glow shone through, a really healthy skin, giving oil. I especially love this within my evening routine, I often use this and nothing else, overnight it just relaxes, hydrates and softens my skin. Sukin Nourishing Chia Seed Oil was an introduction to a brilliantly priced and effective facial oil. One of the best PR samples I have received as it has saved me a lot of money, having spent a few years buying an expensive chia oil because my skin responds so well to the rich in omega ingredient. This was the same, with similar ingredients gorgeous skin results. Sukin's oil is a blend of hemp seed, olive fruit, parsley, chia and kale extracts, perfect for all skin but so good when skin is particularly dull and lacklustre. This another oil that just lifts my skin and gives it life. Having used Monu skincare many times the beauty of this Hawaii Soothing oil didn't surprise me in the least. From the sweet smell to the beautiful oozing oil, it is so perfect for all seasons. Developed for combination skin, blending sandalwood to hydrate, lavender to soothe and grape seed oil to balance the skin, this absorbs, leaving a slip to the skin, another oil that can be used as part of either or both morning and evening skincare routines. La Belle Lune, the heartbreaker, my skin really has issues with rosehip, it depends on the blend and this sadly just doesn't work for me and my goodness I have really tried. For the first couple of days, this stunningly packaged oil blends and absorbs leaving my skin with a dewy finish. La Belle is an organic oil, packed full of omega 3,6 and 9, vitamin A, B and E, UV blocking, lycopene and beta-carotene. Sadly, after a few days, my skin reacts and my forehead starts with small spots, these can also develop around the mouth and cheek area. I have stopped and started so many times with this oil because it is beautiful but, it is time to stop trying, unfortunately, this particular oil and blend isn't for my skin. Elemis Pro-Collagen Marine Oil, the bottle imbues the marine title, glorious sea green with the luscious blue of waves on the shore, it is a delicate vial of oil, with the ever-present pipette that I prefer to use for oils, especially as I often drop the product directly onto my face, especially with watery oils which this is, so I don't waste a single drop. Developed as a replenishing oil to hydrate, nourish and moisturize the skin it includes a selection of seaweed known for its vitamin, mineral, anti-bacterial and anti-inflammatory properties and a troupe of fruit, floral and herb seed oils. I have thoroughly enjoyed using this oil, but, when it came to 'properly' looking through my oils for this piece, I just didn't feel it quite reached the heights of some of the others, a perfectly good and skin loving oil, for a picky person like me it's a tiny difference but some of the others give my skin more. 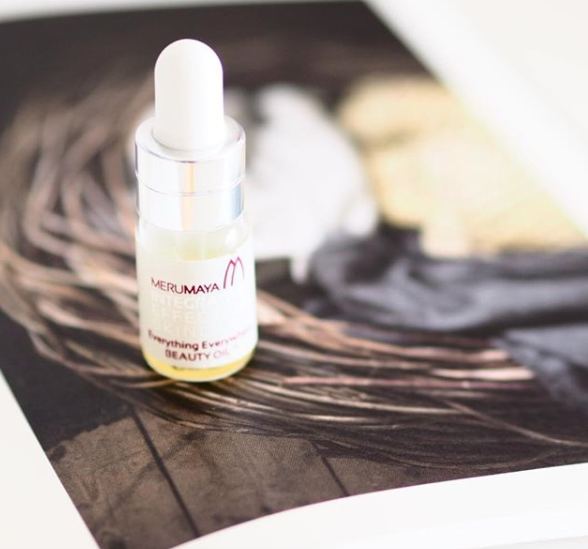 An honourable mention goes to Merumaya, this Everything Oil, is perfection, I have only had a sample but, will be buying the full size once I have used a few oils and need to replace my stash again. Votary, this is a newbie and I have yet to open it and melt into the world of neroli and myrrh, both ingredients my skin adores. More to come on this one. I use facial oils every day, they work alone or blended with other products, I add them to foundations and moisturizers, I adore using them alone and just inhaling and pressing them into my skin. I find pressing them into my skin gives the best results I don't have a set order for applying oils and serums etc, it depends on the consistency, how I find working with the oils. Often I will use a serum first and then the oil but, I also apply oils first and follow with a serum. I adore applying oils to fresh, clean skin, with no product and feel it ooze over the face, perfect. Coming soon serums, masks and skincare extras.